WELCOME to A Blog for All Things Art. While attending the Associated Writing Programs (AWP) conference in Portland, Oregon last week, I noticed the theme ‘fake it until you make it’ can be a powerful motivator. After all, if You don’t believe in what you’re doing, how can anyone else be expected to believe it? 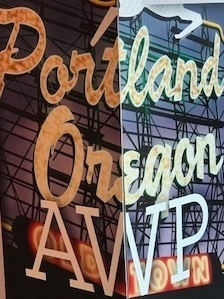 More than 12,000 writers attended AWP this year at the Oregon Convention Center. Author panels and on- and off-site readings included Pam Houston (Deep Creek: Finding Hope in the High Country, Cowboys Are My Weakness, Sight Hound, Contents May Have Shifted), Stephanie Land (Maid: Hard Work, Low Pay, and a Mother’s Will to Survive), Terese Marie Mailhot (Heart Berries: A Memoir), Ariel Levy (The Rules Do Not Apply, Female Chauvinist Pigs), Cheryl Strayed (Wild, Torch), and from the Cuba Writers Program, authors Alden Jones (The Blind Masseuse: A Traveler’s Memoir from Costa Rica to Cambodia, Unaccompanied Minors), Dariel Juarez (A Kind of Solitude), and Tim Weed (A Field Guide to Murder & Fly Fishing, Will Poole’s Island). I wouldn’t say that anyone at AWP was ‘faking it’ but I will say that it takes tons of guts to put ourselves out there, to be seen and heard through our work, and in such a personal way. Sometimes, we have to fake it just a little (talk ourselves out of those self-defeating narratives) in order to get started, to create something meaningful. But LeBron keeps getting in our way. This year, he did it in a style that was becoming of humanity’s greatest athletes. His basketball acumen, ability, and intelligence has yet to be matched. Clevelanders know all this because they see him play every night. I also know. I live in Toronto.